The day he returned home from the US, Princeton undergrad Sukrit Silas was greeted with multiple shocks. First, he discovered at the airport that the new $1,000 guitar (just under Rs40,000) bought as a surprise gift for his kid brother was misplaced in transit. At home, his mother received him sporting a wide bandage on her forehead. And finally, horror of horrors, the lunch that had been planned in his honour was aloo paratha. His mother, injured and bandaged after a fall, makes a compromise meal of rice and paneer—and fondly watches her eldest son eat. In somewhat Dickensian fashion, Silas arrived to what have been the best of times and the worst of times for the family. 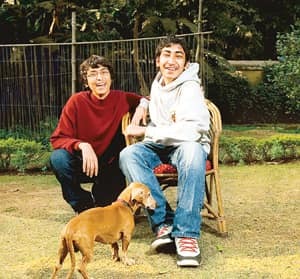 The joy following the homecoming of the elder son is only too apparent: the pet dachshund Goofy gambols around, torn between the squirrels in the garden and the long-lost Silas; brother Shashwat, 15, plonks himself on the garden table in excitement only to break the glass top, and mother Satbir, chief electoral officer in the Delhi state government, breaks into laughter every other second. Yet, permeating the happy family reunion is a family tragedy: the teenagers’ paternal grandfather died just five days ago. Their father, Sandip Silas, missed his son’s homecoming as he tends to family rituals in Agra. “In fact," says the boys’ mother, “Sukrit was coming down especially to meet his grandfather…my father-in-law was a cancer patient and we knew he wouldn’t live long." That meeting would never happen. Silas, an alumnus of St Xavier’s Senior Secondary School, left for Princeton University, a member of the prestigious Ivy League, in August; he’s among the six Indian studentsadmitted by the elite school this year and being tracked by Mint as part of The Indian Education Dream series since 27 November. At Princeton, Silas is pursuing integrated sciences, a course “bordering physics, chemistry and biology", and which still doesn’t have any formal textbooks with students having to rely entirely on lectures. “Princeton stands for liberal arts education, that’s its philosophy." For his many new friends, he has admiration: “You meet exactly the kind of people you want to meet." He concedes he was homesick the first two weeks, that he had to contend with the differences in culture, but then, “it’d be boring if it were the same". Father Sandip Silas himself stays abroad these days; he’s taking a year’s sabbatical from his regular job with the Indian Railways to pursue an executive master’s in public administration from Syracuse University. “He’s very distraught," says Silas. The Silases’ Agra residence is also the place where his mother slipped and got hurt when she had gone to make funeral arrangements. She’s now staying away from office for a few days, working from home, partly on account of her injuries, and partly on account of her elder son’s brief sojourn. The evening before Silas landed in India on 20 December, Satbir Silas was an anxious woman. “He’s never been out before, this is the first time he’s been out on his own…his brother is an excellent cook, Shashwat will bake an apple pie, let’s see if he wants aloo paratha, he likes McDonald’s and KFC, but he has these there anyway." Indeed, when she asked Silas if there was anything special he wanted cooked on his first day home—after the aloo parathas were vetoed, he told her: “I don’t know, I think I’ll eat out." Settled comfortably in a cozy cane chair in the garden lawn, with his hands tucked into the pockets of a Princeton University sweatshirt, Silas sighs: “I miss Karim’s." Visiting Karim’s, the popular restaurant in Delhi’s crowded Chandni Chowk neighbourhood, and tucking into his favourite Mughlai dish—chicken noorjehan—seems to be the only firm plan the youth has during his 10-day winter break. Silas concedes he has no plans, apart from catching up on Will Smith’s I Am Legend, a movie he missed on campus, with friends. “I’ll make plans as I go along." The plan that went horribly wrong was the one woven around the precious guitar for his brother, an excellent guitarist who loves classical music. Silas even had a camera in his bag, to shoot his brother’s expression when he handed over the gift at the airport. He spent nearly three hours at the airport trying to trace the guitar—Silas reckoned it’s either in Newark or Mumbai— and later told his brother he got delayed looking for a lost bag of clothes to keep up the surprise element (appropriately enough, the guitar did show up on Christmas). Jet lag clearly showing on his face, Silas warms up when talking about his sibling’s culinary skills. “Shashwat’s going to make an emotional apple pie for me tonight," he says, not missing the irony of an Indian homecoming marked by something “as American as apple pie." When his brother downplays his talent, Shashwat Silas describes his jeera rice and superb chicken tikkas—often snatched even before they reach the dining table. The brothers share a bond that goes beyond blood ties— a common love for music. Even as they waited for the paneer for lunch, the two jammed on their favourite instruments: Silas on the piano and Shashwat Silas on his old guitar. This will be Silas’ last Christmas visit to the near 100-year-old red-brick bungalow on Delhi’s Belvedere Road that has been the family residence these past 18 years; the family will move to a “newer" apartment built about 40 years ago, but the sons don’t seem too happy. The old place boasts rich memories and the silly fights they regularly had as kids. Not mere pillow fights, clarifies Shashwat Silas, which he affirms are for the sissies. Standing a head over Silas, he ribs his elder brother: “And you lost, shortie." But, as Silas has learned four months into his American education journey and last weekend as he travelled to Agra to pay his respects, the home you leave is never the one to which you return.